In one of my favorite movies, “North by Northwest” (Gary Grant starred, Alfred Hitchcock directed), there’s a scene where Grant’s character figures out where the femme fatale is going by rubbing a pencil over the paper that was under the paper she wrote down an address. That’s the premiss of this particular creative activity. a burnishing tool, this can be anything that has a smooth point to it, like a knitting needle, a nut picker, the tip of a pen cap, etc. 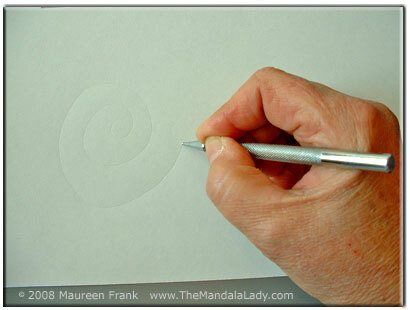 Step 1: Take the burnishing tool and draw a spiral on the paper. 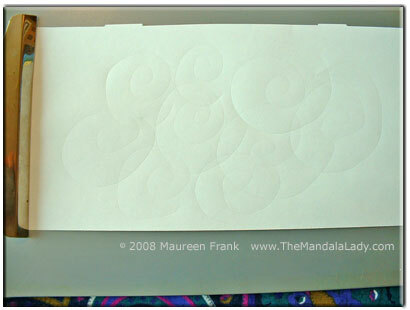 Step 2: Draw as many spirals as you want on the paper. 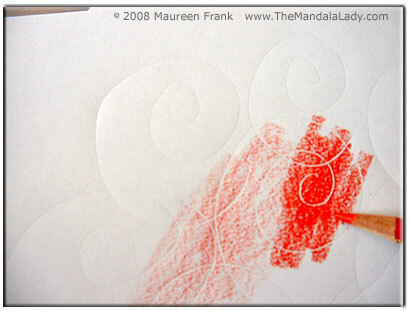 Step 3: Using a color pencil, in this case I used the red, color over the spirals. 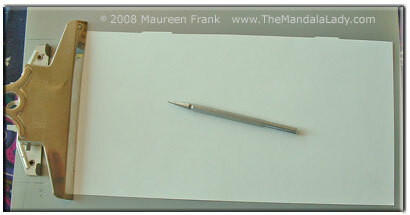 In this photo, I used the side of the pencil tip and colored with a light pressure. 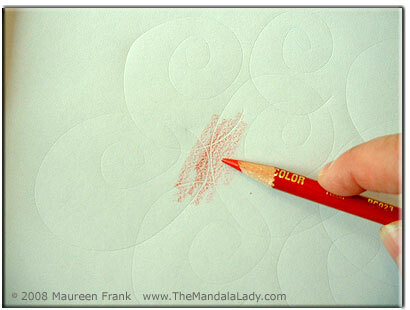 What you’ll see that where the spiral was burnished into the paper, remains white, while the rest of the area takes on the red color. Step 4: Now color with hard pressure. When you do, the white of the burnishing shows up even more. Step 5: Add another color, in this case I added yellow. Color over the existing red (it will become orange) and into the uncolored area. Step 6: Now add some blue. Here too, color over some of the existing red, and then into the uncolored area. 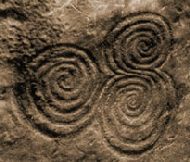 Notice what makes that spirals stand out more, and where they are less noticeable. This particular exercise was about showing you how to create a unique look to your coloring. Here’s an example of an mandala I did using this very technique. Hello there! I have no clue why no one has commented on your wonderful site. I found it through someones suggestion on http://www.deviantart.com. 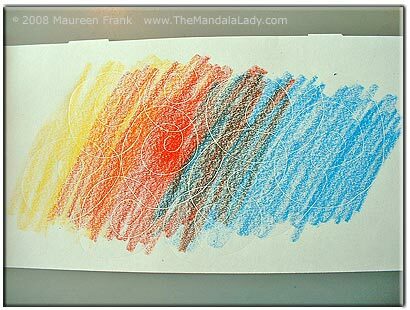 I really liked the Mandela. What kind of color pencils did you use? I’m going to try out the burnishing one of these days. It works better on Bristol board? My favorite brand of color pencils is Prismacolor. They work especially well with the burnishing technique. Bristol, illustration, rising board, or any heavier weight paper will work. 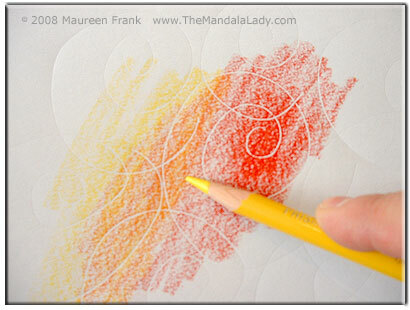 For the mandala in this blog, I used back side of mat board (it was a cut-out for a mat I used on another painting). Beautiful mandala! I am curious about whether or not this technique would work with watercolor pencils? And can a CD be used as a template to draw the circle or is there a specific size that it has to be? I am somewhat of a beginner so I could use all the help I can get. I recently started using colored pencils and now I am using watercolor pencils. 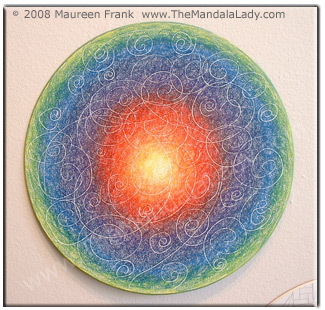 Mandalas can be any size. I’ve made them as small as 4″ diameter up to 3 feet in diameter. 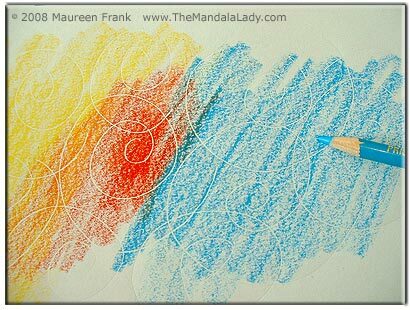 Watercolor pencils are fun to use and always a surprise when water is applied. As for this technique working with w/c pencils…that’s a great question. Try it! I’ll try it as well and make it another post. themandalalady.wordpress.com’s done it again. Incredible post.